Spare Tyre Covers with Fishing related themes. For the fisherman with everything, get a fishing design on your spare tyre cover. Can't see what you need? Ask about our custom tyre covers. For the Fisherman with everything. Black tyre cover design. 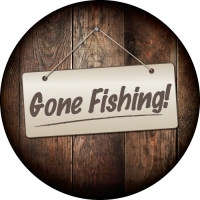 For the Fisherman with everything with a blue swirly water background! 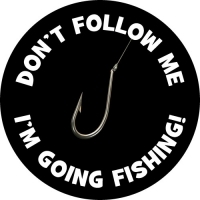 Let everyone know your intentions with a Gone Fishing Sign on your spare wheel cover! High Quality Tyre Cover Design, sized to suit your tyre. 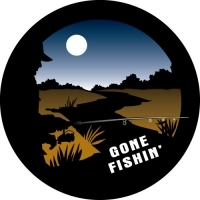 Gone Fishin custom wheel cover design. Fishing Tyre Cover Design. 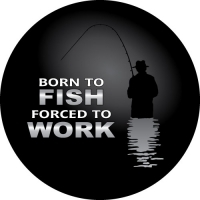 Show your love of fishing with this great wheel cover design. 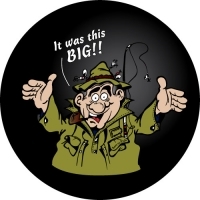 Fisherman never, ever exaggerate! 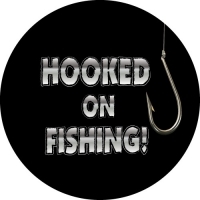 Perfect for the fisherman with a story telling knack! High quality custom sized spare wheel cover. 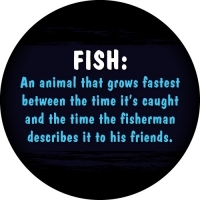 Describes a fishes fastest growing stage! 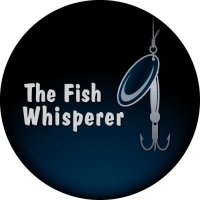 Show your love of fishing with this great wheel cover design. The Fish Whisperer!! Show your love of fishing with this catchy fishing phrase. 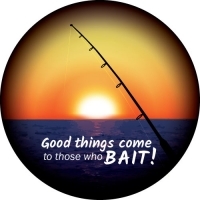 "Good things come to those who BAIT!" Bright and colourful fishing sunset.